At Laser + Holistic Dental, Invisalign® is our preferred orthodontic treatment approach for a number of reasons. Almost Invisible: thanks to clear aligners – Invisalign is more subtle than conventional braces. This cosmetic advantage makes Invisalign popular for teenagers and adults wanting to straighten their teeth and improve their smile. Hygiene Advantages: the aligners are easy to remove and clean, preventing food from being trapped and a build up of bad bacteria. Metal Free: Invisalign uses no metal unlike braces. The aligners are made from a medical grade polymer that doesn’t contain the nasty plastic additives found in some alternative options. To learn more about Invisalign® orthodontic treatment and if you are a suitable candidate, please use the links below or continue browsing through the page. Invisalign® is the future of orthodontics to deliver great smiles. Invisalign® uses a series of clear, removable aligner trays that gradually shift your teeth into the desired position over time. 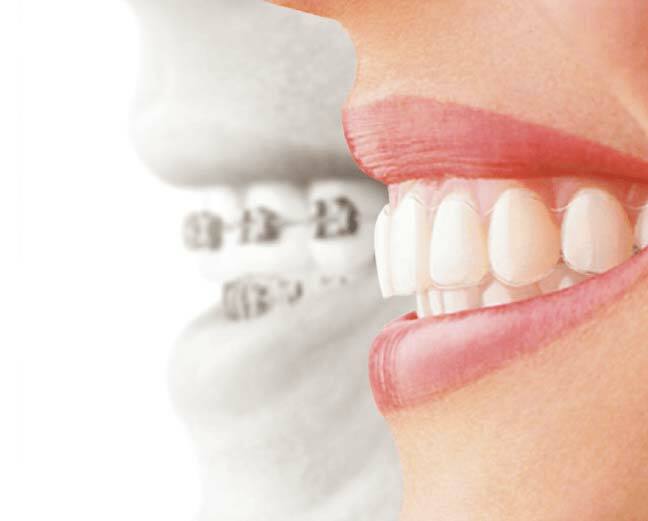 Laser + Holistic Dental prefers Invisalign® to coventional braces, as there are no metal brackets that often lacerate the interior of the mouth, and also can contribute to Nickel sensitivities. Unfortunately not everyone is a candidate for Invisalign®, generally due to narrow arches of the jaw or other irregularities. However Laser + Holistic Dental has had proven success for those previously considered unsuitable for Invisalign® by taking an integrated approach and expanding your jaw bones to the point where Invisalign® can become effective. Contrary to popular belief Invisalign® is not a generic procedure. Favourable patient outcomes are dependent on the skills of your dentist or orthodontist to design the movements necessary to move your teeth into the correct position. Invisalign® then manufactures the aligners with 3D computer imaging technology to your dentist or orthodontist’s specifications. A complete course of Invisalign® generally takes 9-18 months depending on how often you wear the aligners and the degree of difficultly of your case. You will wear each set of aligners for about 2 weeks, removing them only to eat, drink, brush, and floss. As you replace each aligner with the next in the series, your teeth will move little by little, week by week – until they have straightened to the their final position. Laser + Holistic Dental will do a review on how things are progressing about once every 6 weeks. Invisalign® is great for adults and teenagers, proving popular for its natural look allowing you to smile with confidence. See if Invisalign® treatment is right for you – please call (03) 9078 0387 or contact us. For all Invisalign cases Laser + Holistic Dental has various financing options available to help you stop delaying, and start creating the smile you have always wanted. Please visit this page, call (03) 9078 0387 or contact us to learn more about your options.